First of all, MOOCs are Massive. There is no strict definition of what constitutes a massive number of students in a course but the numbers can range from a few thousand to a few hundred thousand. What is more important though, than the number of participants, is the fact that MOOCs can, in theory, scale indefinitely in order to accommodate ever-increasing numbers of participants. The institutional cost of adding more students is effectively zero, especially if the course is designed to reduce or even eliminate faculty interaction with students. Whether this is a good thing is yet to be explained, and there is some debate over whether this is desirable in online learning as it may negatively affect the ability to engage meaningfully with other participants. The ability of MOOCs to scale effectively is probably the feature that is most attractive to institutions but again it should be noted that this is not a characteristic unique to MOOCs, and that television and radio were both touted as being able to bring education to the masses. MOOCs are also Open, although how open-ness is defined makes a significant difference to how the courses are run. In the general sense of the word, MOOCs are open in that anyone with access to the Internet and a computer or mobile device is able to sign up. In this sense, open is taken to mean that there is no charge to participate, even some MOOC providers do charge for accreditation. However, there is another meaning of “open” which is largely ignored by the majority of MOOC providers and that is related to licensing. For example, Coursera (one MOOC platform provider) determines which institutions can host MOOCs on its platform, which means that the system is not open access. They also own the rights to all course materials, so they cannot be repurposed or reused without permission. In addition, course material may be completely removed from the Coursera site when the course ends. In this respect, it should be noted that many online material are made available with open licenses, often in ways that are more accessible for reuse than MOOC material. MOOCs are offered at least initially wholly Online, but increasingly institutions are negotiating with the rights holders to use MOOC materials in a blended format for use on campus. In other words, the institution provides learner support for the MOOC materials through the use of campus-based instructors. For instance at San Jose State University, on-campus students used MOOC materials from Udacity courses, including lectures, readings and quizzes, and then instructors spent classroom time on small-group activities, projects and quizzes to check progress. Again though it should be noted that MOOCs are not unique in offering courses online. There are over 7 million students in the USA alone taking for-credit online courses. One characteristic that distinguishes MOOCs from most other open educational resources is that they are organized into a whole Course. However, what this actually means for participants is not exactly clear. Although many MOOCs offer certificates or badges for successful completion of a course, to date these have not been accepted for admission or for credit, even (or especially) by the institutions offering the MOOCs. While the media frenzy surrounding the emergence of MOOCs is new, the idea of providing flexible access to higher education is not. The UK Open University, founded in 1969, has offered inexpensive and flexible learning opportunities to people who were not able to attend a traditional institution. "There are two types of MOOCs. On the one hand, there is the xMOOC - this is a formal course created in a site like Coursera or EdX. An xMOOC will have regular lessons, videos and assignments, be led by an elite university professor, and attract a large online audience. These are the MOOCs that have received most of the attention in recent years and have generally shaped people's impressions. But there's another type of MOOC, called the cMOOC, which is based on connection rather than content, which looks more like an online community than a course, and doesn't have a defined curriculum or formal assignments. These were the original MOOCs, and they posed a much greater challenge to both the educational institutions that offered them and the participants who studied in them." - Downes (2015). People have started experimenting with different ways to use different kinds of MOOCs. Rather than seeing them in opposition to each other, some educators have tried to see how they could work together to achieve different objectives. Spend a few minutes discussing the relative advantages and disadvantages of MOOCs in the context of physiotherapy education. Does it have a place? What might it be good for? Can you think of any courses that could benefit from being implemented as an open online course? Have someone in the group act as a scribe and share your thoughts in the online workspace. Bates, T. (2014). Comparing xMOOCs and cMOOCs: philosophy and practice. Bates, T. (2014). What is a MOOC? Caulfield, M. (2013). xMOOC communities should learn from cMOOCs. Downes, S. (2015). Becoming MOOC. Liyanagunawardena, T. R., Adams, A. A., & Williams, S. A. (2012). MOOCs: A Systematic Study of the Published Literature 2008-2012. International Review of Research in Open and Distance Learning. Mackness, J. (2013). 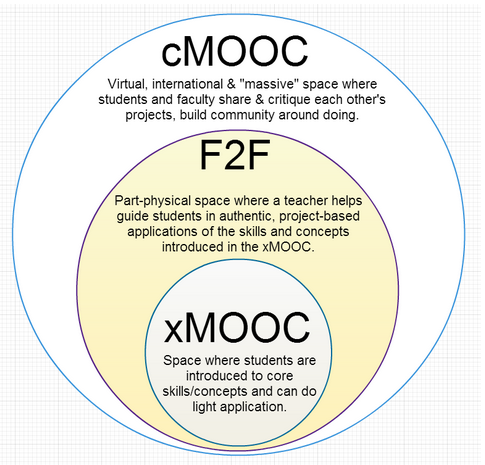 cMOOCs and xMOOCs: Key differences. Mohamed, A., Yousef, F., Chatti, M. A., & Schroeder, U. (2014). MOOCs: A Review of the State-of-the-Art. CSEDU 2014 - 6th International Conference on Computer Supported Education, 9–20. Morrison, D. (2013). The Ultimate Student Guide to xMOOCs and cMOOCs. The maturing of the MOOC: literature review of massive open online courses and other forms of online distance learning. (2013). London.